The Untertuerkheim plant, shown, will be modernized to keep in-house products with competitive relevance, Daimler says. BERLIN (Reuters) -- Daimler will invest billions of euros in the coming years to upgrade a key plant as the company adjusts facilities to the growing need to assemble fuel-efficient powertrains. 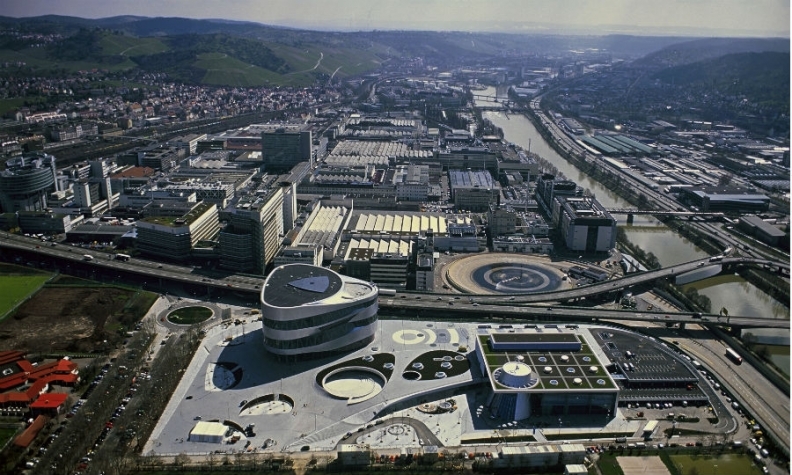 Daimler will spend 1 billion euros ($1.06 billion) this year alone to modernize the factory at its headquarters in Untertuerkheim, near Stuttgart. The plant builds engines, transmissions and axles for Mercedes-Benz cars. Steps agreed with top labor representatives will keep the plant's workforce stable at about 18,700 people and yield cost savings "in the range of hundreds of millions of euros until 2020," Daimler said in a statement Wednesday. "We are not only improving our flexibility and efficiency, but also developing a plant with a tradition stretching back over 110 years into a high-tech location for CO2 technologies," said Markus Schaefer, head of production at Mercedes-Benz Cars. The Untertuerkheim factory will become a center of competence for fuel-efficient engines, hybrid powertrains and the production of fuel cell systems, Daimler said. Starting June 1, Untertuerkheim will assume responsibility for a facility in Nabern, also near Stuttgart, where assembly of fuel cell systems will take place. The Nabern facility will remain the center of competence for the overall development of fuel cell drive systems. The Untertuerkheim plant will add to its engine portfolio two new gasoline engines and a new four-cylinder diesel engine. It will also focus exclusively on the production of automatic transmissions for rear-wheel-drive vehicles. The focus of the efforts to streamline and modernize the product portfolio is to keep in-house products with competitive relevance and to assign other tasks to suppliers, Daimler said. The foundry in Esslingen-Mettingen and the forge in Untertuerkheim are integral parts of the plant and will remain so in the future. Daimler, the world's No. 3 maker of luxury cars by sales, has pledged to further raise production between now and 2020 to eclipse German rivals BMW and Audi. Germany's three leading premium manufacturers are pushing efforts to develop alternative powertrains, including those fully powered by batteries or a combination of electricity and combustion engines, to bring down carbon dioxide emissions and meet rigid CO2 limits in Europe and other regions.